Airstrikes by Russia’s strategic aviation has destroyed concentrations of armored vehicles and facilities producing weapons for Islamic State militants, says the Russian Defense Ministry. Unlike the previous sorties, this one was carried out by bypassing Europe, while the cruise missiles were launched from the Mediterranean Sea. The Russian air force has once again involved strategic aviation in its Syria campaign: On Nov. 17, Tu-95MS missile-carrying bombers took off from the Engels airfield (520 miles east of Moscow) and launched Kh-101 cruise missiles against militant targets on the outskirts of the cities of Idlib and Homs. Along with the strategic bombers, the mission involved Su-33 carrier fighters from the Admiral Kuznetsov aircraft carrier, with Su-30SM aircraft providing their cover. According to the Russian Defense Ministry, the air strikes were carried out against ISIS command posts, weapons-making facilities, arms and ammunition depots as well as areas where militants’ hardware was concentrated. “The coordinates of all the targets were checked and verified via several intelligence channels. The results of the strikes were controlled by unmanned aerial vehicles,” the ministry’s official spokesman Maj-Gen Igor Konashenkov said. While previous sorties of Russian strategic bombers proceeded above the Caspian Sea and then over the territory of Iran and Iraq, the route of this mission lay above the northern seas and Eastern Atlantic, while the cruise missiles were launched from the Mediterranean Sea. 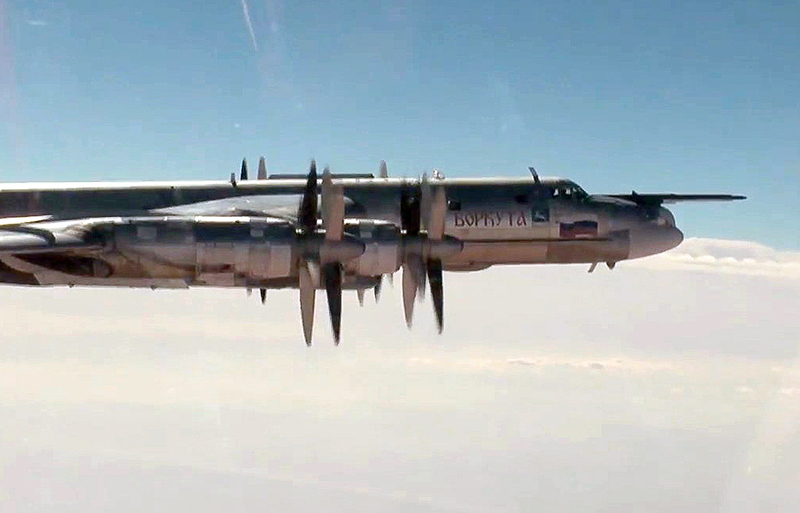 In the end, the Tu-95MS aircraft covered a distance of 11,000 kilometers (6,800 miles) with two mid-air refuelings. According to the head of the Kulon group of companies, Pavel Bulat, the decision to more than double the length of the route was deliberate. “The Aerospace Forces are practicing the capabilities of strategic aviation in the event of a complete closure of airspace. One needs to make sure that one’s pilots can get anyone anywhere,” he said. However, the military did not specify which route the Tu-95s took on their way back home. The president of the International Center of Geopolitical Analysis, retired Col-Gen Leonid Ivashov, pointed out that Russia does not have capability to transfer its strategic aviation to Syria without spending extra money on fuel. “The Khmeimim airbase in Syria, which is currently being used by front-line aviation, is not suited for strategic bombers. Its runway is too short and the necessary infrastructure is missing,” he explained. According to Pavel Bulat, the latest combat sortie had the task of carrying out a simultaneous strike against all the detected militant targets. “It is for tasks like these that strategic aviation is used. There is a military term for it – a massive aerial attack,” he said. This causes disorganization in the enemy ranks and gives a considerable advantage to ground troops, Bulat explained. “’Spare’ bombs are used to hit transport communications, thus isolating combat areas. Take, for instance, sorties made by Russian front-line bombers to destroy ISIS oil refineries and convoys of oil tank trucks moving towards Turkish territory,” he added. The Tu-95MS is one of Russia’s main strategic bombers capable of firing the newest Kh-101 cruise missiles. “It is a subsonic cruise missile with a range of up to 5,000 kilometers [3,100 miles]. It can be launched from an altitude of up to 10,000 kilometers. Its warhead weighs some 400 kilograms [900 lbs],” a defense industry source told RBTH. According to the source, Russia also has a nuclear-enabled version of this missile, known as Kh-102. “One equivalent of our Kh-101 missile is the U.S. long-range missile AGM-129. Just like the Russian missile, it has a GPS satellite and an inertial navigation system,” the source added. According to the RBTH source, Su-33 fighter aircraft have been provided with a new, high-precision sighting system, the SVP-24, for unguided missiles. The new system makes it possible to dramatically improve the precision of air strikes and to avoid possible casualties among the civilian population. The system adjusts the missile’s trajectory based on the fighter’s position and parameters of the flight. As a result, deviation from the target does not exceed several meters. At the same time, the SVP-24 takes up just a couple of additional blocks in the aircraft’s equipment.